Andy Gulliford is a contributor to Writers on the Range, the opinion service of High Country News. He is an historian and award-winning author and editor in Durango, Colorado. It has happened again. 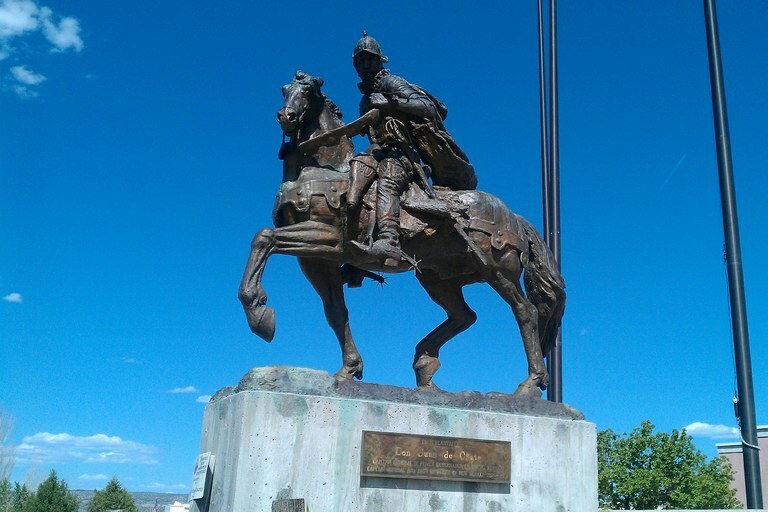 Near Española, New Mexico, the monumental statue of Spanish conquistador Don Juan de Oñate has been attacked. Though Oñate rides his horse behind a tall metal fence, someone painted his booted right foot blood red and spray-painted “Remember 1680” on a nearby wall. In the culturally diverse Southwest, schisms over history and heritage live on. The statue is part of the Oñate Monument Center in Rio Arriba County. While many longtime New Mexicans want to commemorate Oñate’s bold leadership in establishing the Spanish presence in the region, most Native Americans from the Pueblo villages along the Rio Grande River — and specifically Acoma — hold a different opinion. Across the American South, the public is embroiled in controversy over statues of Confederate war heroes. For some white Southerners, statues of Robert E. Lee and Jefferson Davis represent states’ rights, chivalry and valor. For others, including most African-Americans, Confederate leaders symbolize a Civil War fought over the evils of slavery and the perpetuation of racist attitudes. When cities such as Richmond, Virginia, and New Orleans, Louisiana, erected their statues in the 1890s and early 1900s, white people lived and worked nearby. Now, whites have fled to the suburbs and black residents have no interest in being reminded that their ancestors were treated as property to be bought and sold. In the West, many of our statues and monuments portray victory over Native Americans. The obelisk at the plaza in Santa Fe once had the inscribed phrase “savages” in a memorial to the brave New Mexican pioneers. Someone has since chiseled out that word. The statue of Spanish conquistador Don Juan de Oñate should have a plaque explaining Oñate’s dark history. In front of the State Capitol in Denver, a 1909 bronze monument commemorates the volunteers who fought Civil War battles, including Sand Creek in Colorado, which left 150 Cheyenne and Arapaho dead, most of them women and children. In the South, many statues are being taken down or concealed and covered with tarps. In Denver, no one “toppled, desecrated, or put into secret storage” the 1909 monument, writes historian Tom Noel. Instead, it was “preserved in a process that was conciliatory.” In 2002, thanks to Senate Joint Resolution 99-017, the statue received a new Sand Creek interpretive plaque that tells a brutal but accurate story. And so, a grievous historical error was corrected as Cheyenne and Arapaho representatives attended the new plaque’s installation. But in Española, there has been no dialogue. The magnificent, oversized statue of Oñate was erected in 1992 to commemorate 400 years of Spanish settlement in New Mexico. A few weeks after it was installed, someone cut off the statue’s right boot. Why? It is a bitter story. Spanish soldiers, seeking food, raided Acoma pueblo and raped a young native girl. Fighting back, Acoma warriors killed Oñate’s nephew and a few other soldiers. Later, in retaliation, Oñate’s soldiers overran the pueblo and killed hundreds of Acoma warriors, also enslaving the surviving men, women and children. In addition, Spanish soldiers cut off the right feet of 24 men from Acoma as punishment for their defiance. Across the West we need to look hard at our statues and our monuments. We must distinguish between the sometimes-bitter truths of history and the selective memories of heritage. Española could take a cue from Denver. And Rio Arriba County and the New Mexico state Legislature might want to add an interpretive plaque close to the right foot of the Oñate statue.